The Media Ministry is responsible for all the “technical” functions of the congregation. 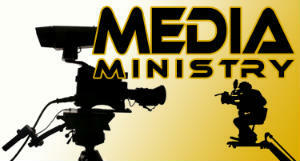 The purpose of this ministry is to serve the church by providing comprehensive media services to the congregation. The ministry team works behind the scenes to make it possible for the church to share the message of God through amplified sound, recordings, PowerPoint presentations and other forms of visual & audio communication. If you ever want to purchase CD’s or DVD’s from a Sunday service, please see any member of the Media Ministry after morning worship.